I Heard Back From UnitedHealthcare - Not Impressed. 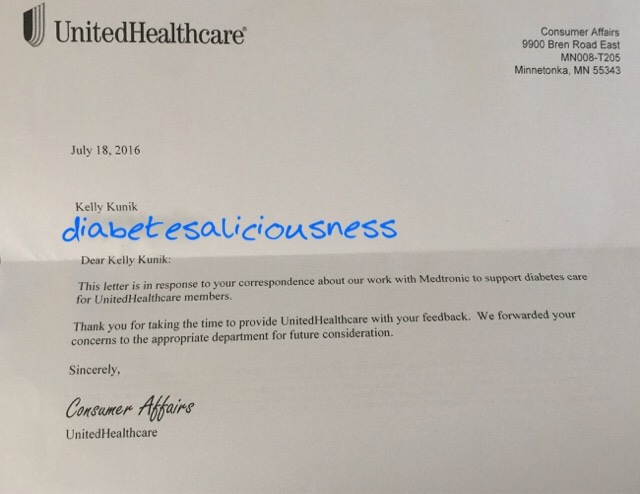 HomeUnited healthcare#diabetesaccessmattersI Heard Back From UnitedHealthcare - Not Impressed. I reached out to UnitedHealthCare several times regarding their decision to limit their customers pump choice to Medtronic. I don�t have UHC as my insurance provider and I happen to wear an out of warranty minimed/ medtronic pump, which I love, but the thought of not having options when it comes to my diabetes and my health keeps me up at night. I received a response from UHC yesterday, it was impersonal to the point of being cookie cutter - and its wording made it seem as if my concerns were incidental and unimportant. My concerns are neither - they are specific and relevant to anyone with diabetes or living with a chronic illness. Talk about innocuous and none specific. A signature with a name ,department, and extension number would have been the proper and professional way to close the letter. Also �Consumer Affairs," if you�re going to forward my concerns to �the appropriate department,� please be specific and state who that department actually is. Like all of you in the Diabetes Online Community and beyond, I'm all about choice when it comes to my life and my life with diabetes � and the options I use to manage my diabetes. I wear my pump 24x7, and as I stated above, it happens to be an out of warranty Medtronic minimed pump. My insulin pump is on my body 23 hours a day - 7 days a week, and 365 days a year. My insulin pump has been with me at every major life event - including my mother�s funeral. It�s traveled with me around the globe and it�s been on my person (or on my nightstand,) at the most intimate of moments. I believe every single person and no matter the disease or condition, deserves and requires choice when it comes to their treatment options. I understand that insurance companies may not be able to give their customers an array of choices regarding insulin pumps - but for God sakes give us choice. Don't dictate a piece of equipment that we must wear for four years and without option. And to both UHC and Medtronic, by removing brand choice from United HealthCare�s patients, you are also limiting CGM choices - so please don�t state in press releases that you�re doing to benefit the patient re: better pricing and diabetes technology. Limiting a patients choice in diabetes technology, like insulin pumps; cgms, test strips, meters, and other diabetes medications, does not benefit patients - it benefits companies. if we don�t continue to speak up. I have been so very happy with my mini med/Medtronic pumps these past 15 years of pumping, but the limitations imposed by UHC & Medtronic to others who live the diabetes lives, has pushed into a corner as a patient and as a consumer. other insulin pump options besides Medtronic - while I still have choices to choose from. And now in picking up the phone and calling my Reps in office.